I have always liked the retrograde hour work that Daniels used in his earlier pieces. As he mentions, it conveys that the watch is a precision timekeeper, and that hours are provided as a sort of courtesy and the focus is on minutes and seconds. 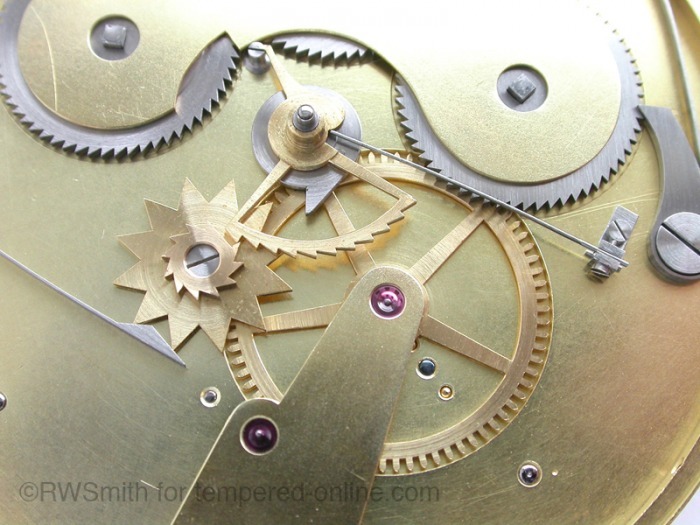 In addition, the retrograde mechanism provides a curiosity to the overall aesthetics. Designing the mechanism was a bit of a challenge, since Daniels didn't provide much in his book for the construction of his design. None of the plates provide an actual photo of the retrograde motion work. 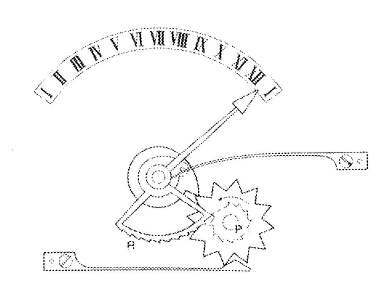 He provides a simple diagram which provides the basic idea of the mechanism: Basically, the minute-wheel pawl advances the coaxial star wheels (P) which advance the hour rack (R) one tooth per hour, the missing tooth on the top star wheel allows the rack to return to one (I). 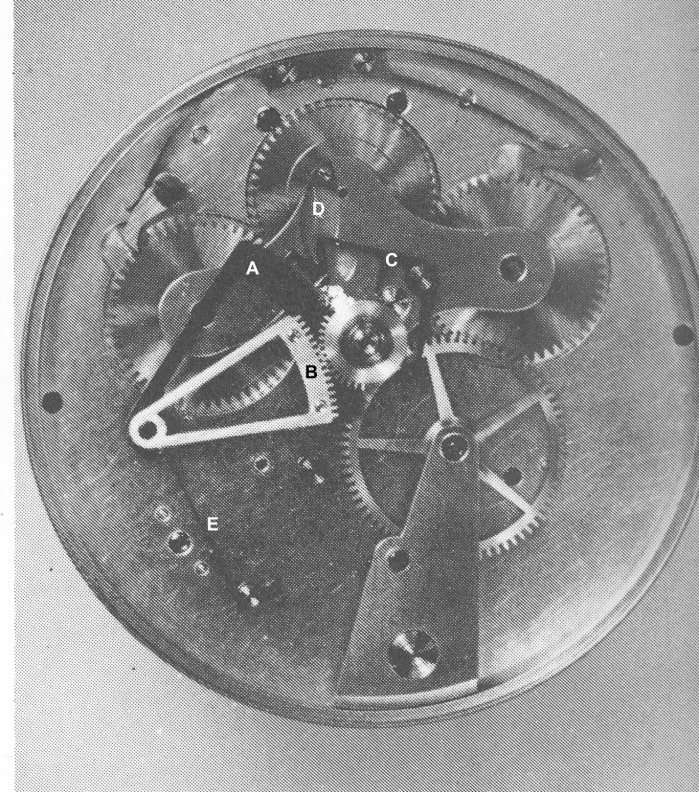 When I tried to find an actual photo of this mechanism, the only one I could find was in Daniels/Clutton's book "Watches". 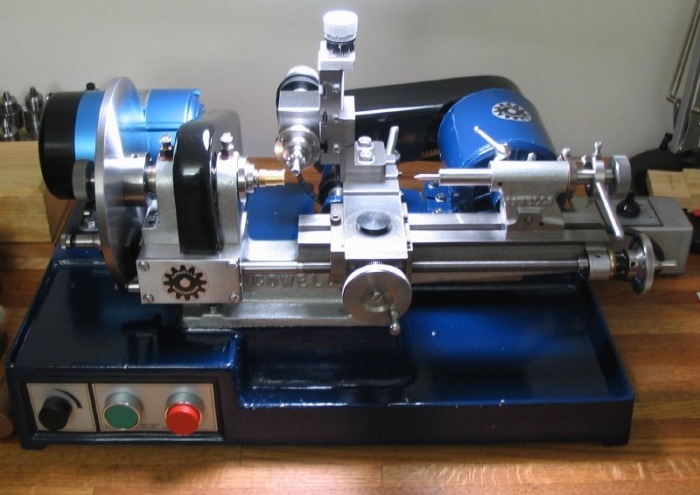 It is somewhat different than the mechanism described in "Watchmaking" and I didn't quite follow it. Rack A and B appear to be fixed together, Rack B mating with the partial toothed hour wheel. Rack A appears to have ratchet teeth, but it isn't clear how this rack is advanced or released. It appears to have a return spring (E) and to be mated with lever C which is held in tension with spring D. Lever C is, perhaps, the tricky part, having three arms. I posted this query on www.tempered-online.com, and much to my surprise I received a response from Roger Smith (via the website owner, Curtis Thompson), who worked under Daniels. He had serviced Daniels' No. 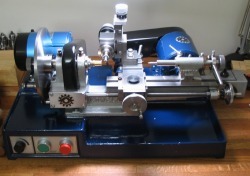 8 (made for Gerald Saunders) which used the retrograde mechanism. The watch depicted in "Watches" appears to be either No. 3, 4 or 5. So I can only assume that George had improved upon the earlier mechanism for the one used in No.8 and that which is described in "Watchmaking." So I will not worry about how that mechanism works for now, and focus on the latter version. "Ask and ye shall receive..." I now had my design, I just needed to figure out how to make it! I decided to start with the coaxial star wheel and ratchet. I started by making various measurements with a rendered version of the photo in AutoCAD and tried to get the basic dimensions down. The star wheel. The only angle cutter I had was the 60 degree ratchet cutter. 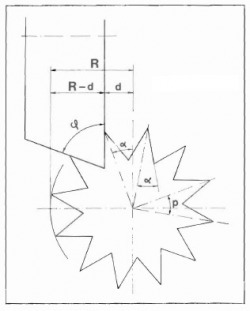 Since the star wheel has an equal angle, the cutter would need to be offset. Some trigonometry was in order.... 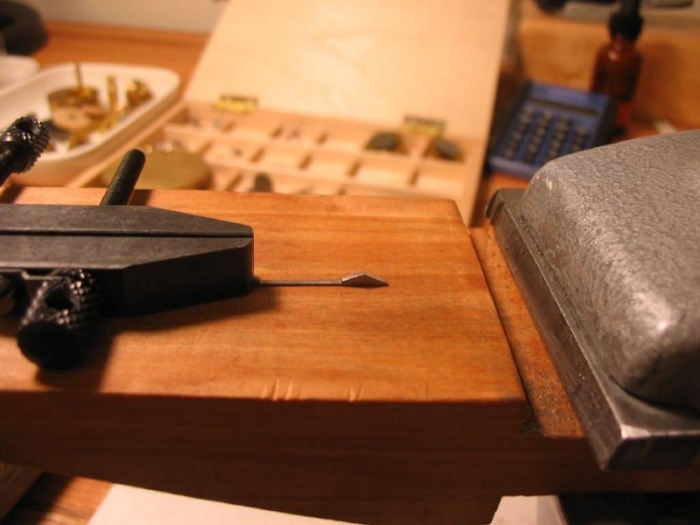 I went to Nicolet's book on turning and milling in horology, a very concise book with various tables and formulae for making watch and clock parts. The diagram below is from this book and provides exactly what I was looking for! (360° ÷ 12) = 30°. I turned a brass disc and adhered it to a superglue arbor, turned it to the final dimensions and milled the teeth. I didn't photograph the process, as this is very similar to previous parts. I took a shot of the star wheel after this machining step. The ratchet wheel. 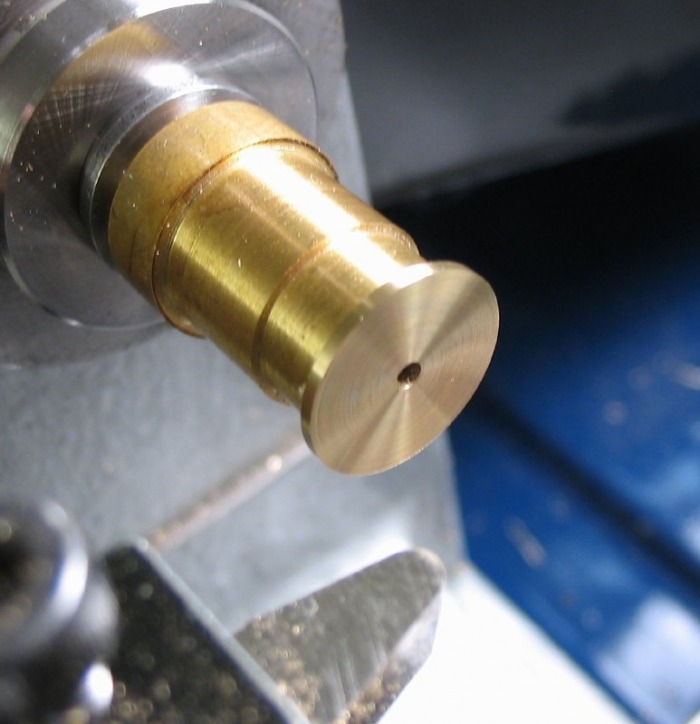 I machined a brass ratchet wheel in a simple fashion using the ratchet cutter. Afterwards I filed off one tooth with a needle file. 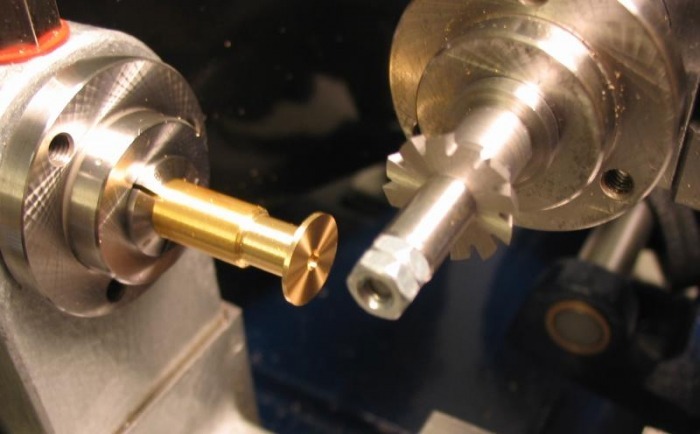 The ratchet receives a counterbore for the retaining screw and the star wheel is broached to friction fit the ratchet. Having derived the dimensions indirectly, when trying it fit the components to the movement, some changes needed to be made. Of course, making something for the second or third time one can see easier or better ways to make it. 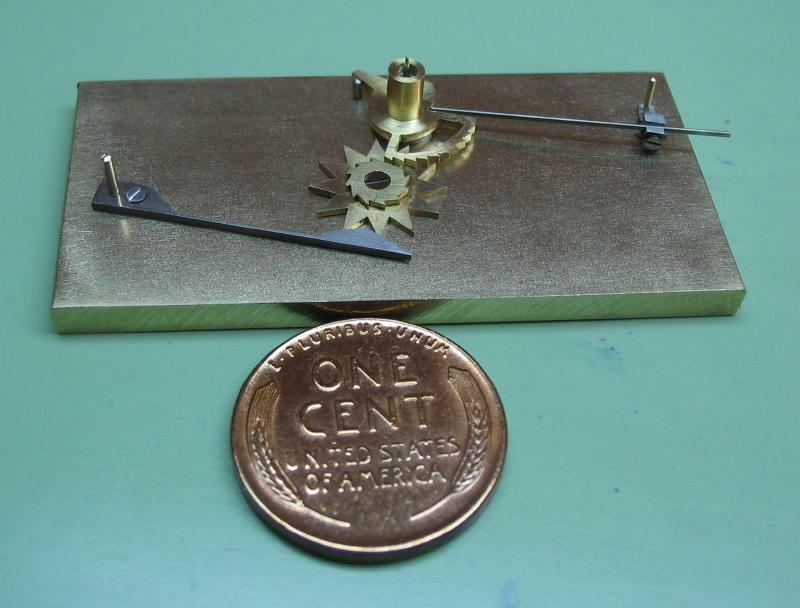 The star wheel was made using a 70° cutter in place of the 60° cutter. This gives another 10° to the tooth angle (2α = 70° - 30° = 40°). After looking at the new price list from P.P. Thornton, I noticed they make ratchet cutters in a smaller form, better suited for cutting these small watch parts, they are 14mm O.D. 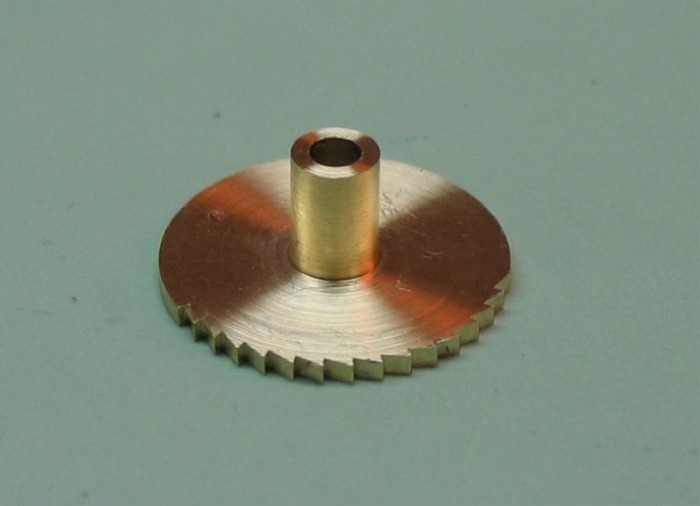 The star wheel is made from 1/2" brass rod (Type 360 ). 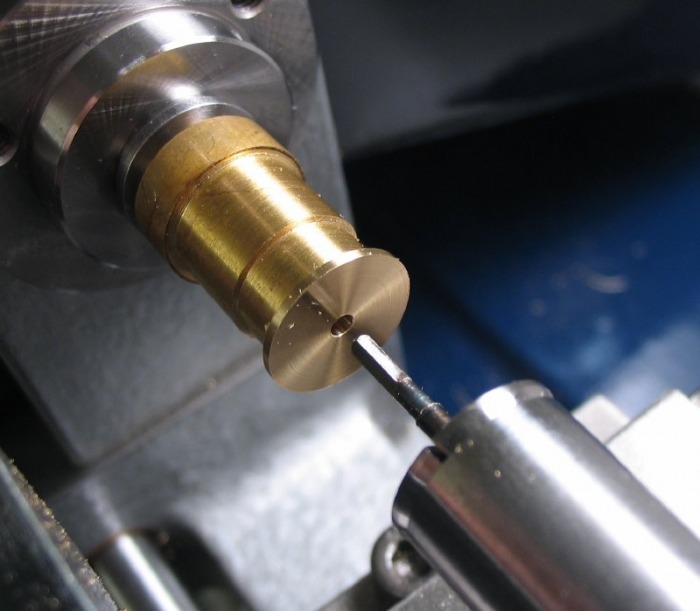 A disc is machined by facing the rod, drilling a pilot hole (for roughly centering later on), and then parting off, slightly oversized. 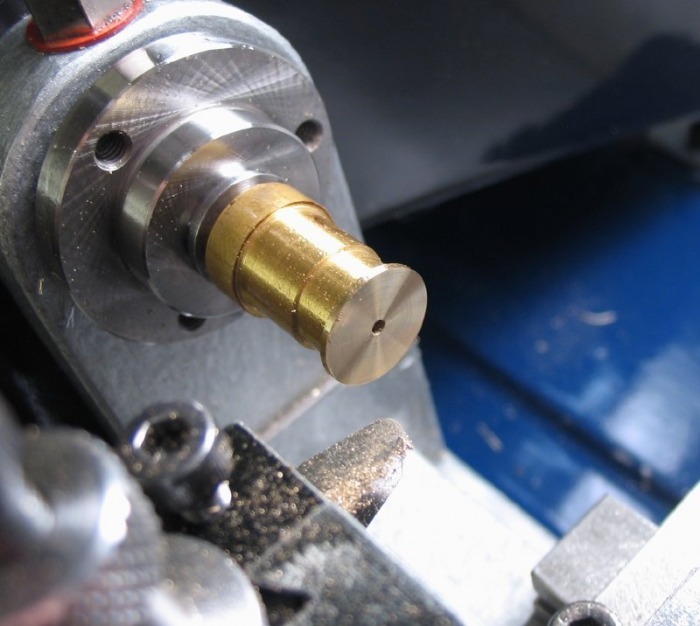 The faced side of the disc can be mounted to a super glue arbor (freshly faced and re-grooved) using the tailstock center to position and hold in place until the glue has cured. 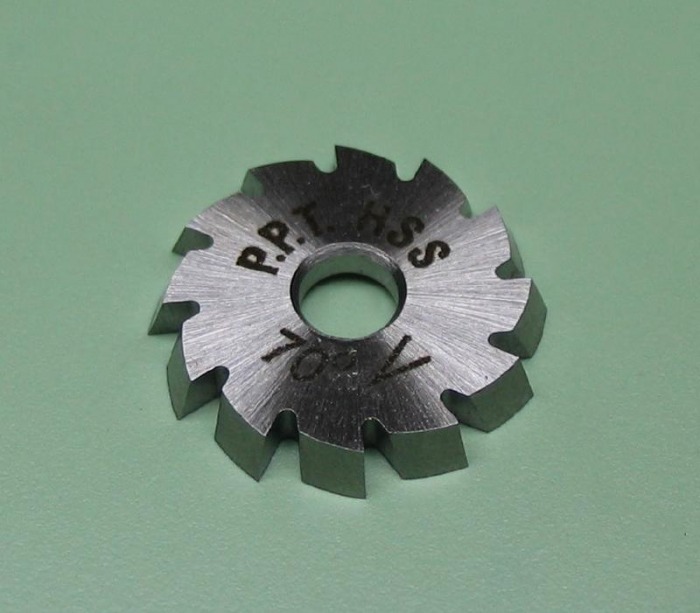 The disc can then be faced to final thickness, the center hole bored to friction fit the boss on the ratchet count wheel, and turn to the full diameter (11.0mm). 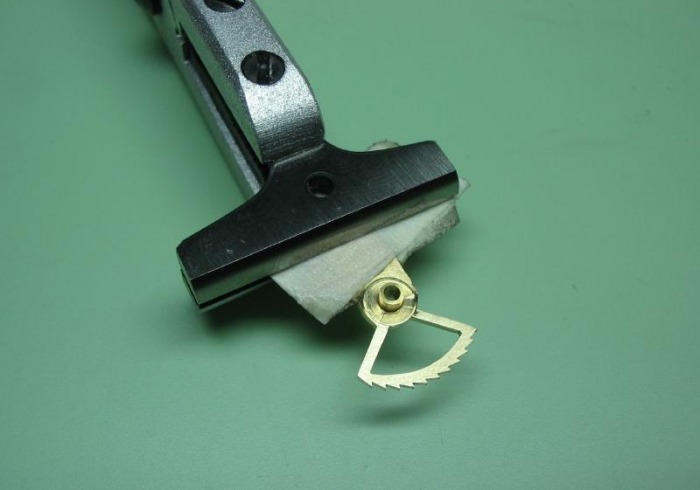 The cutter can be setup. The offset required can be calculated with the previous formula (d = R x sin α), where 2α=70 - (360/12). R is the radius (5.5mm). 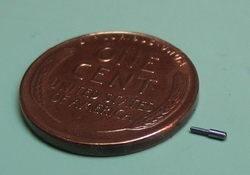 d = 1.881 mm. The cutter was fed at maximum speed and in several passes. 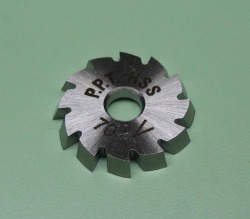 The finished wheel is shown after the milling is complete. The previously made ratchet wheel is staked into the new star wheel after broaching the center hole the star wheel to a friction fit. 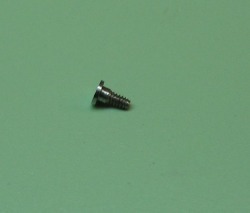 A new screw was made, since I have become a little better at making screws, and was not completely satisfied with the previous one. 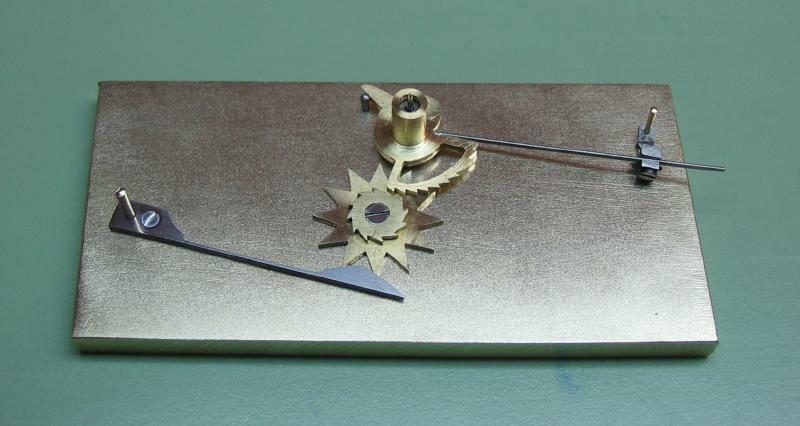 Shown are the completed parts and a test assembly on a piece of brass plate. 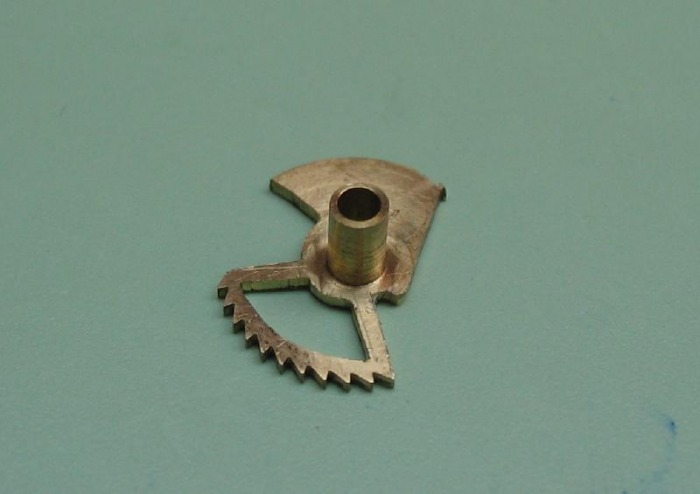 The spring detent for the star wheel is cut from 1/32nd O-1 gauge plate with a piercing saw and filed to shape. 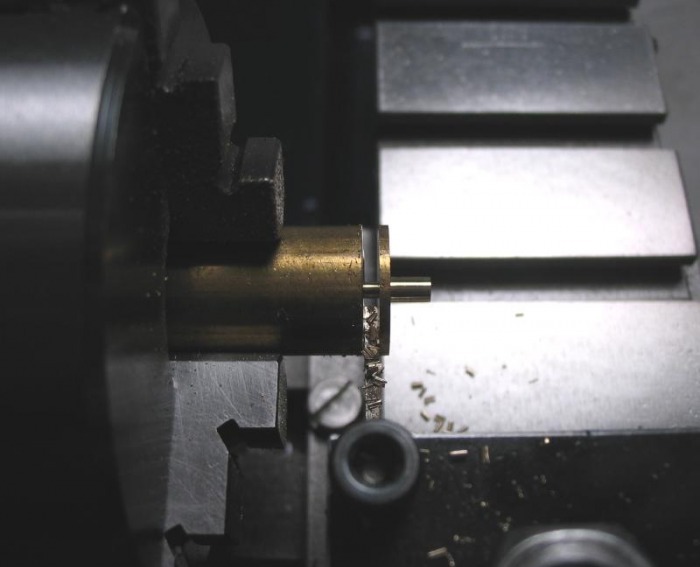 I used a toolmaker's clamp and the bench pin to assist in filing the delicate spring portion. 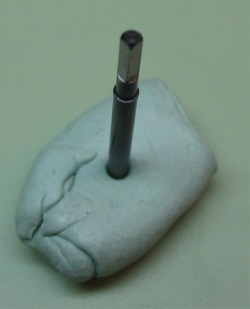 Rough detent spring and a freshly made 0.6mm screw with countersunk head. Making the hour rack - In place of an hour wheel there is rack mechanism which mates to the ratchet wheel. The missing tooth on the ratchet wheel allows the rack to return. 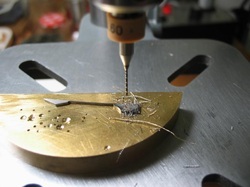 I started by turning the basic dimensions and milling the ratchet teeth around part of the circumference. I calculated that if I want the hour hand to make approximately a 100 degree arc and the rack has 11 teeth, if it continued for 360 degree it would be approximately 39 teeth. In order to use an available index count, multiply by two to give 78, so every other hole to index these teeth. I then starting cutting out the basic dimension of the rack with a piercing saw and cleaning up with No.6 escapement files with safety edges, as I did for the spokes of the center wheel. Turning the pipe and drill undersize. Affix the blank to a super glue arbor. It is mounted inverted, so that the ratchet teeth will be oriented correctly. The glue arbor was drilled to lightly friction fit the pipe on the rack. 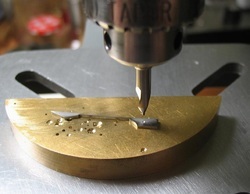 It could then be faced to the final thickness and turned to full diameter (12.0mm). A reamer was made to open the pipe to fit the cannon pawl. The reamer is simply drill rod turned to diameter, and using the roller filing rest, a 90◦ cutting edge. It is then hardened and tempered to straw. 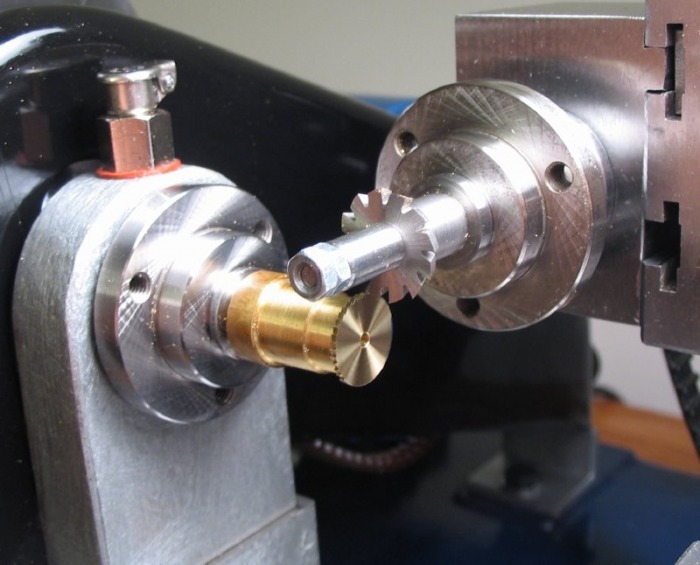 The milling cutter is setup with the new 70 degree profile cutter. 9.2 degrees x 12 gives ~110 degree for the hour hand arc. After sawing out and filing the general shape. A couple photos of the first attempt at making the rack, it was too large in radius to fit the space available. 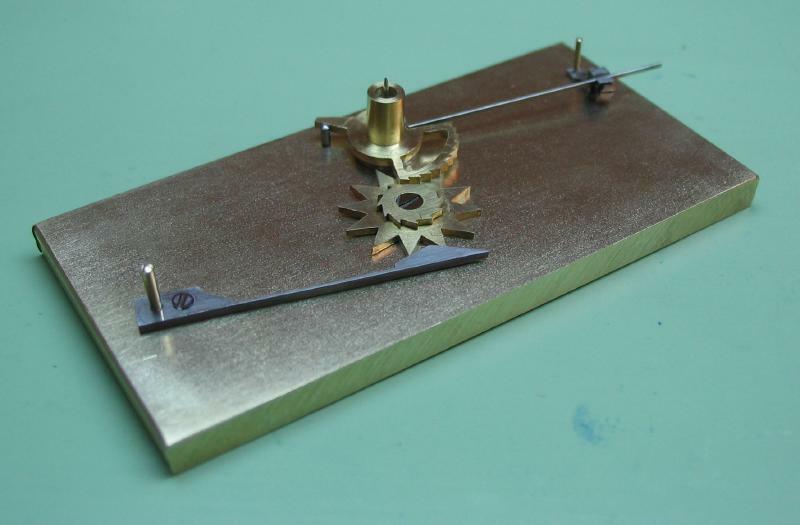 A return spring is needed to keep the hour rack in tension and to return it to the one position when the ratchet reaches its missing tooth. 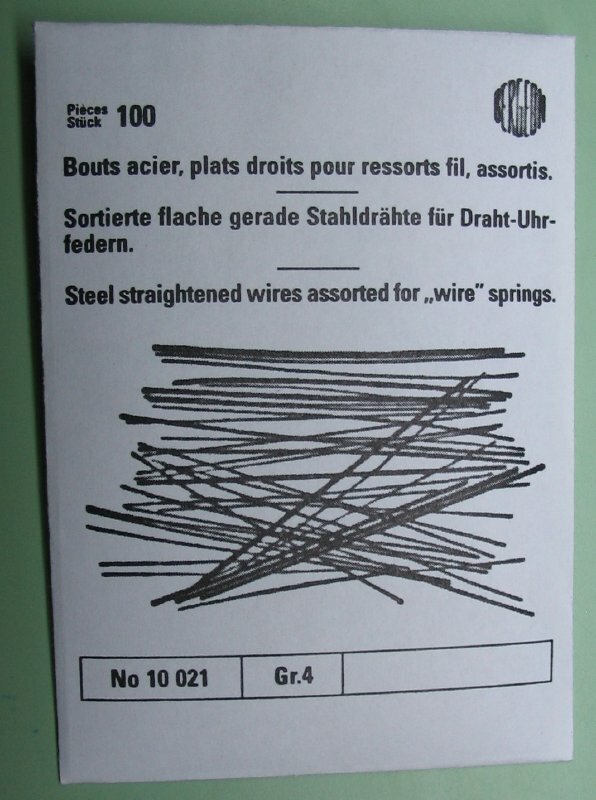 The return spring is made from flat spring wire, which is sold by Bergeon (No. 10021). 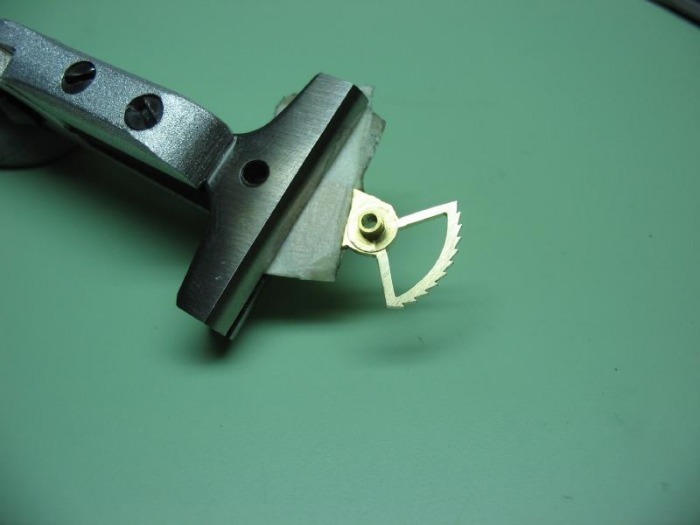 A bracket is made from O-1 gauge plate, screws are made to secure the bracket to the mainplate and the spring to the bracket, a small square nut was made to receive the screw to clamp the spring wire to the bracket. 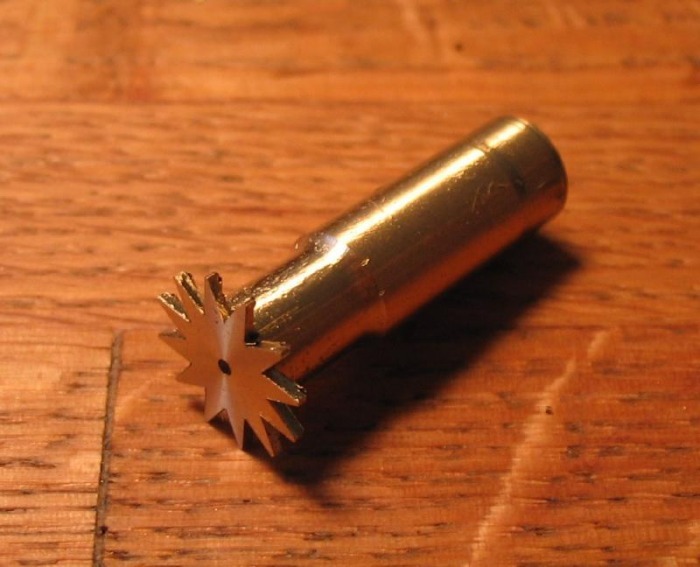 Cannon Pawl - In place of a traditional cannon pinion, there is a cannon pawl which clicks the star wheel once per revolution (one tooth per hour). 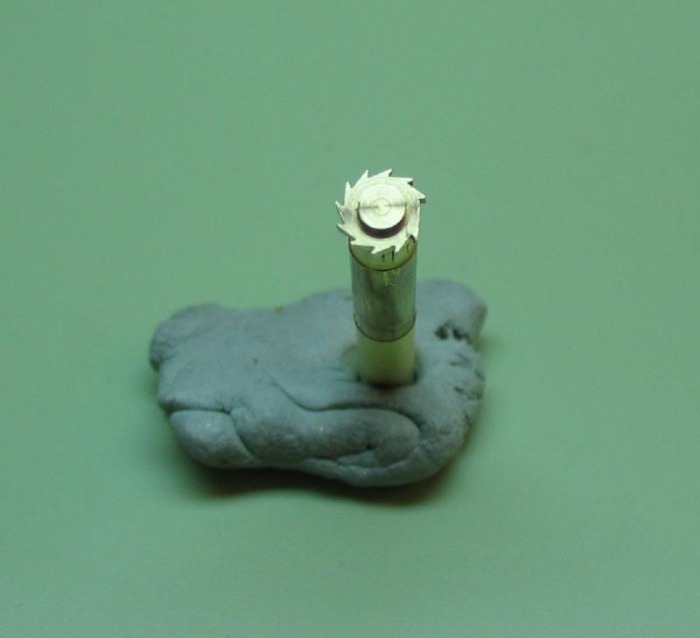 I started by turning the 'cannon' pipe portion and the full diameter of the pawl portion. This was made from 10mm O-1 drill rod. 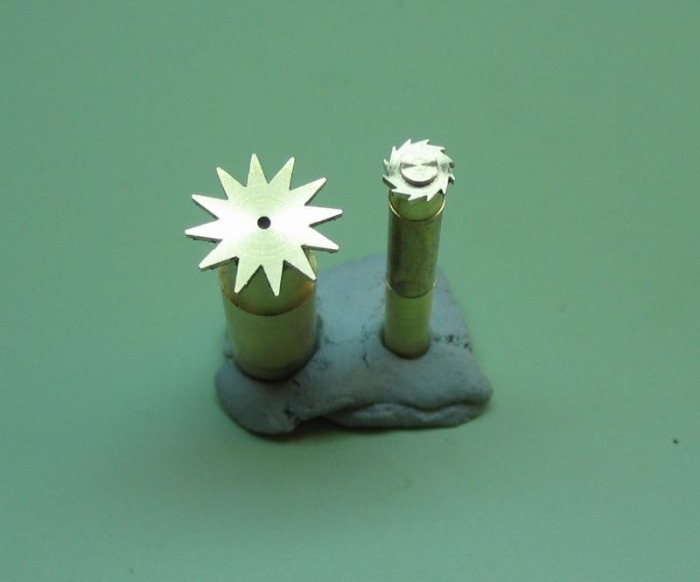 The actual pawl finger needs to be sawn/filed out, I decided to do this after fitting the rack to the ratchet wheel and then fitting the pawl to the star wheel since the pawl finger is the simplest of the components to form by hand. In order to get this mechanism working, I made a test plate. It allows one to test the fit and drill holes rather liberally without the fear of ruining the watch plate. Once the correct setup is determined, the measurements can be transferred to the watch plate. I started with the cannon pawl. It was filed down to form a finger. It still needs some finishing work, but it functions in advancing the star wheel with sufficient clearance. 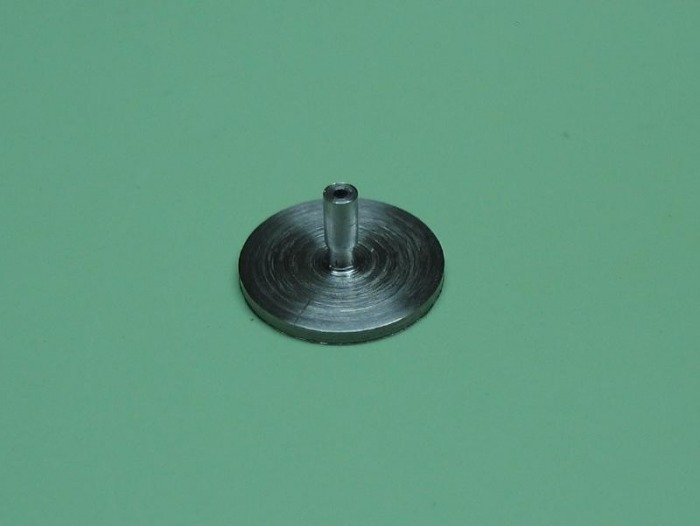 The detent is attached, hour rack return spring attached, the hour rack filed to final dimensions, and a banking pin was made and fit to the plate. 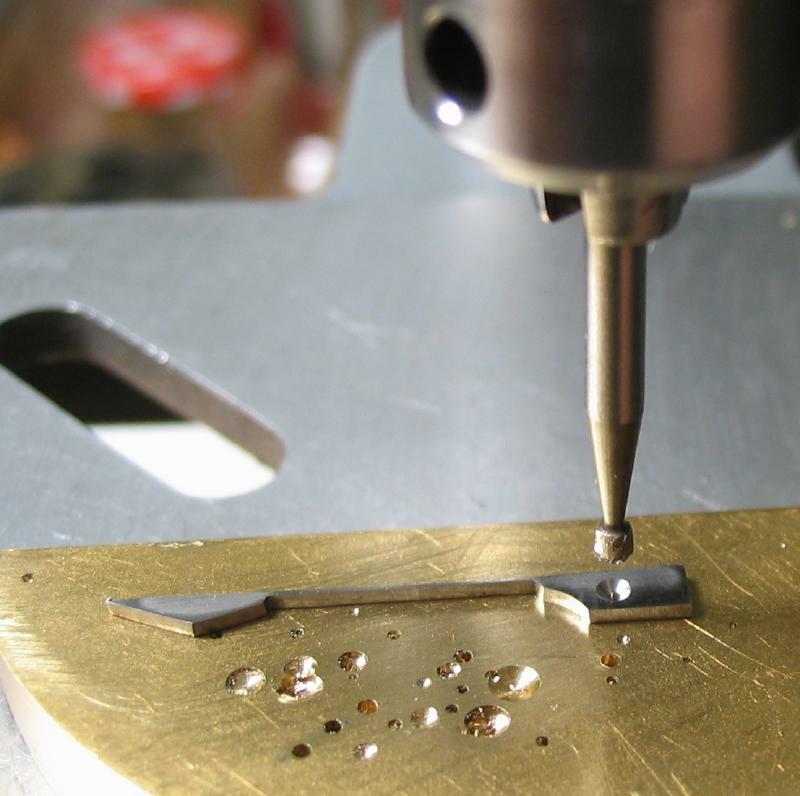 Once parts are secured to the plate, the action of the components can be more accurately assured. Also their interplay is more rigid and reproducible. 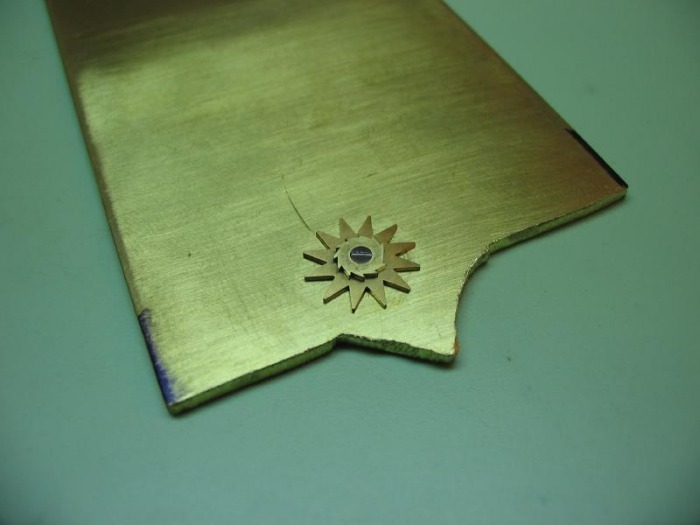 Metal was removed very slowly with escapement files, and frequently checked for its effect. At the 1 o'clock position the rack is free of the ratchet, but held in tension against the banking pin by the return spring. 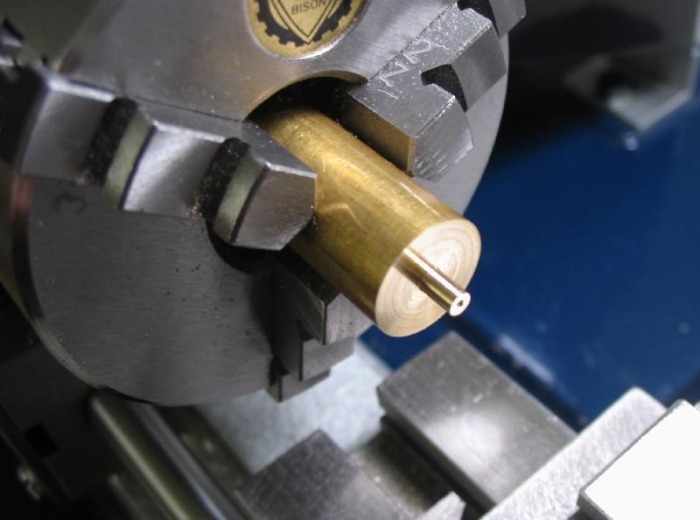 This position for the star wheel must be found and the steady pins fit to the detent and return spring base.